Round Or Square: Which Café Table Is Best? One of the most important elements of a café is its furniture. Sometimes, it is your café setting that will beckon to people to come and taste the exquisite brew of your coffee. It does not mean that if you have the best tasting coffee in town, you would no longer care about how your café looks. You should at least consider both aspects, especially when you are still in the planning stage. There are basically two types of furniture that you need for your café – the chairs and the tables. Since these café furniture pieces are the most visible ones, you need to choose the right type for your business. When it comes to café tables, there are two primary shapes – round and square. 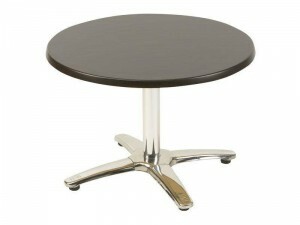 Round shape café tables could often seat three or four depending on the size. Square shaped ones would either seat two or four. So which one should you prefer? There are actually certain advantages when you choose one over the other. Below are some comparisons between these two main café table shapes. The first thing that will be affected by your choice of café table is your space. It is way easier to arrange the tables if they come in squares. At the same time, you will be able to put the tables side by side without leaving some space in between. This is something that you cannot easily do with round tables. Try to put round tables side by side and you will see that there will always be some space in between them. If your primary concern is aesthetics, there might be some degree of class with a round café table. Round café tables can look really classy and elegant. This does not mean that a square table will not make your café look posh. It is just that if you want to add some bit of contrast, then you may opt for a round table. There are some cafés that would actually combine both types of tables. Sometimes, they would consult an interior designer who can provide them with a good plan on where the round tables will go and where the square tables will be. Once fully set up, you will still be the judge whether the whole setup looks appealing or not. If you are that particular about the materials that are used, then it will be best if you check out the different materials that we, at Nextrend, are offering you. We will always provide you with a good list of materials for your café tables. Most materials are available for both round and square tables. Your preferred café chairs will also influence which tables are the most suitable for your business. Some chairs are best partnered with round tables while others look better with square ones. You can try taking a look at the different shapes and sizes of café chairs that are available here at Nextrend. We can provide you with a host of designs and shapes, which will match the table that you have chosen. The choice between round or square tables might be minor to some but it could spell a lot of difference for your business and for your customers. Whether you prefer contemporary furniture, or those that can be termed as classic, we can always provide you with good, sturdy, yet elegant-looking materials that you will be proud to include in your array of café furniture. Whether it is tables or chairs that you need for your café, we have got everything that you could possibly need. Just head over to our Products page to view our extensive collection of café furniture and request a free quote – thanks to our huge stocks, we can organise an immediate dispatch and have those quickly delivered to your café!